Alcide Amedeo Francesco De Gasperi (3 April 1881 – 19 August 1954) was an Italian politician who started the Christian Democracy party, and helped to start the Council of Europe and the European Coal and Steel Community. He was the Prime Minister of Italy for eight years, between 1945 and 1953. That is longer than any other Italian prime minister except Benito Mussolini, who was a dictator. 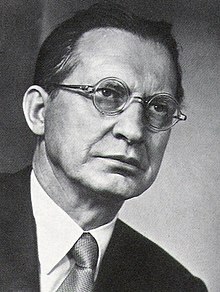 De Gasperi was born in Austria-Hungary, and did not become an Italian citizen until after the First World War. In 1927, he was put in prison for one and a half years because he did not support Mussolini's Fascist government. Mussolini released him from prison because the Pope asked him to. ↑ The Florentine. "The Florentine - article » In the beginning was De Gasperi". Retrieved 18 January 2016. ↑ "ITALY: Man from the Mountains". TIME.com. 25 May 1953. Retrieved 18 January 2016. This page was last changed on 11 July 2018, at 03:33.